Get an alert when your in a great spot for a selfie. Shake to take picture & preview. Anyone can take a great picture, but only you can take a great selfie. Many years ago, I took a trip to Europe with a small digital camera. Looking back at those photos, I realized that I took pictures of everything--but I didn't have any pictures of myself. Luckily, in the time since that trip, the selfie has been invented! Never again should anyone take generic pictures, indistinguishable versions of which may be found with an online image search. I have set out to make the camera (app) that I want to use around town, and on my next trip to capture the unique images that can only be captured with a selfie. Know When It's a Selfie Moment. There are so many amazing things in this world that anybody can take a normal picture of, but only you can take a selfie of! Never forget to take a selfie showing your smiling face at the best spots on Earth. As you visit places throughout the day, your phone compares your updated location to a database of landmarks and other great spots to take a selfie. Your phone will alert you when it detects you are stopped at the best places in the world to take a selfie. The alerts are based on our own database of over 7,000 places people have taken epic selfies, and a custom filtered GeoNames.org database of 300,000 important landmarks around the world. After initially exploring the map while on Cellular or Wi-Fi, the maps and notifications will continue to work while you are offline so don't worry about using up your international data plan while exploring distant lands! Quick Launch to Wide-Angle Camera. SelfieShake launches directly to the camera to enable non-nonsense quick and easy selfies. The live preview allows you to squeeze yourself (and your travel companions) into the picture while you are next to amazing things around the world. Once you have framed the perfect shot, simply shake your phone and a "3, 2, 1" countdown will appear before a simulated flash fades into a preview of your selfie. Selfie Stick Optional. You only need to shake the phone with your arm so you do not risk making the dreaded "duck face" or even worse--dropping your phone--while attempting to concentrate on hitting the shutter button. However, for those who are super serious about their selfies, SelfieShake works fantastically with a selfie stick! Quick Post-Selfie Preview. The selfie preview will stay on the screen for three seconds before sliding off the screen so that you can take another selfie. While the preview is on the screen, hit the share button to share the selfie using your favorite apps like SMS, Facebook or Snapchat. You can also always share later from your phone's built in Photo Library. Location Information and Settings. Privacy is Important. The settings menu contains Privacy options that enable you to choose whether or not to share anonymous location information about where you take selfies. (Note: We only collect the location of the selfie with your permission, your photos are only saved to your phone and are not sent anywhere or to anyone unless you explicitly do so.) 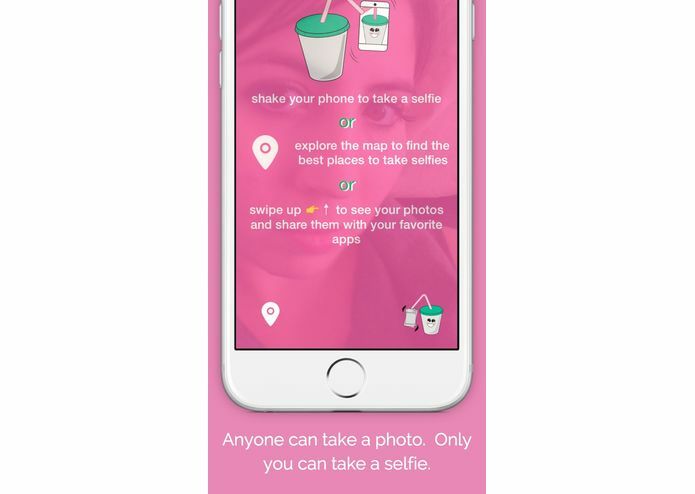 Since the launch of the original version of SelfieShake, people have taken and shared the location of over 7,000 selfies. We hope you help your fellow SelfieShake users by choosing to share the absolute best spots on the planet you have found to take selfies! The original version of SelfieShake was very minimal and only provided the ability to take a picture by shaking the phone. 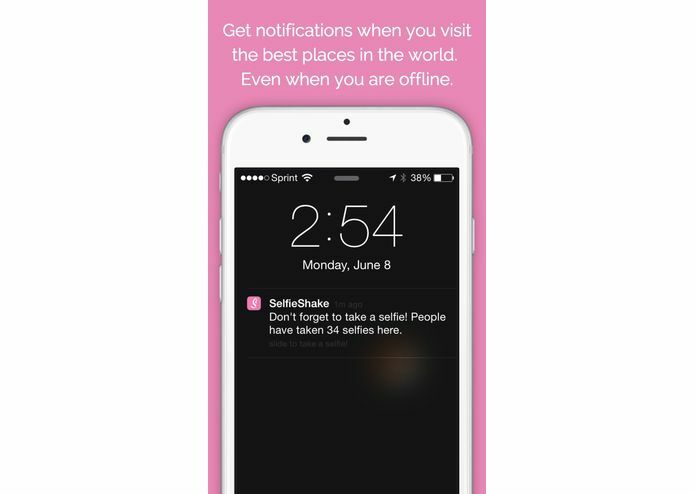 Users could optionally contribute the location information about where they took their selfie to the SelfieShake back-end database. However, this data was not used by the application before this jam. I have endeavored to keep the application minimal while improving the look and feel of the application and adding helpful location-based features. 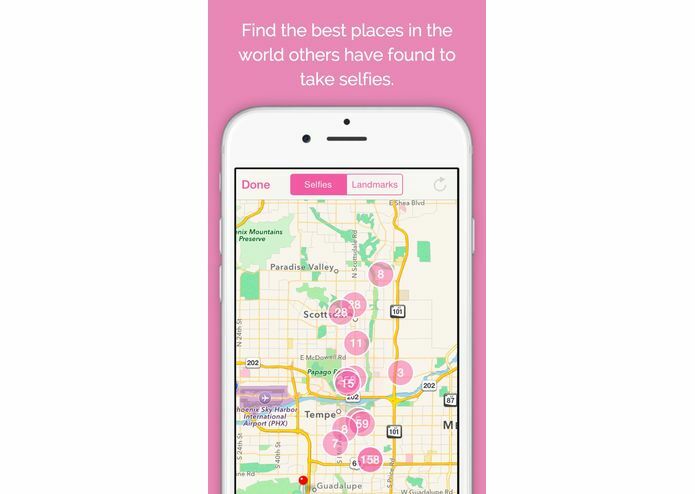 I wanted to use the data I had been collecting, and also add additional location data to the app, to remind people to take selfies when they are in the best spots around the world. I also added a post-selfie image preview feature that auto dismisses after a few seconds. Users can quickly see the photo they took without having to interact with the phone. The preview then automatically slides off the screen as to allow users to take another photo without having to dismiss the preview manually. Full Screen Camera. The camera used to be a square, but this made it hard to squeeze into the frame with amazing buildings and places around the world. I have improved the camera to fill the entire screen for great landscape photos, and portrait photos with tall buildings. UI Animations when Screen Rotates. The prior version had UI elements that would rotate to match the screen orientation, but they would snap. I have added animations to all transitions to further polish the application. Swipe Up To View Photo Library. I have added the ability to swipe up on the camera view to browse your selfies and share them from within the app. Instructions. I have added instructions that are shown briefly when bringing up the camera to help first time users of the application. Ads Removed. I have removed the Ads that were in the first version of the application. Nobody likes Ads. Preview Image After Taking a Selfie. After taking a selfie the first thing everyone wants to do is take a look! To facilitate this, I have the screen simulate a flash that "develops" into the selfie. The user is given 3 seconds to review and share the selfie before the photo slides off screen and the user is able to take another selfie! Ability to share from SelfieShake to your favorite other apps. 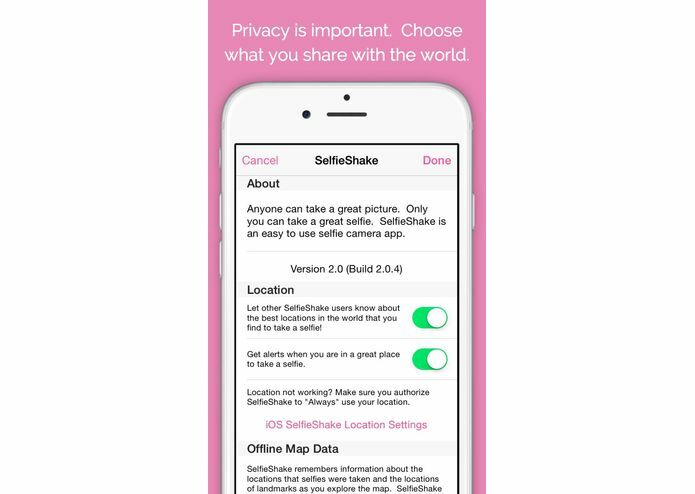 Users can now share their selfies from directly in SelfieShake, without having to change to the built in Photos app. Clustering Map View. The first version of SelfieShake recorded the locations of selfies that users took, but there was no way to see this data. To enable browsing of the 7,000+ and growing best selfie locations around the world, I added a clustering map view to the app to expose this data. Open Landmark Data. In addition to our own database of Selfie locations, I also integrated a database of approximately 300k selected landmarks that can be browsed on the map (including places such as: airports, amphitheaters, amusement parks, ancient sites, ancient walls, beaches, breweries, calderas, canyons, castles, cliffs, crater lakes, craters, diplomatic facilities, ferry terminals, gardens, graveyards, historic sites, lighthouses, missions, monuments, museums, natural and man-made arches, observation points, parks, ruins, shrines, squares, tombs, towers, vineyards, and waterfalls) (Source: Geonames.org). Notifications When Visiting a Good Spot to Take a Selfie or a Landmark. The app will now send a local notification to the user when they are visiting a place where another user has taken a selfie, or one of the selected landmarks. If the user has already taken a selfie there, the app will not provide the notification to avoid annoying the user. Works While Offline. Do not worry about using up your international data plan! Explore the best places to take a selfie before your trip, or while on WiFi at your hotel, and get location notifications while you are offline and exploring distant lands. No internet is required once you explore the map around where you are going on your next trip. If you forget to do that, don't worry, once you connect to Wi-Fi at your hotel--SelfieShake will automatically cache the nearest selfie hot-spots and selected landmarks so you will still get notifications when you are out (tip: leave Wi-Fi enabled for best results, iOS uses the Wi-Fi to help determine your location while minimizing use of GPS to maximize battery life).